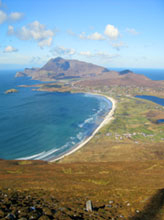 Special Offers at Beach Cottages, Keel, Achill Island. We would like to assure you of a friendly and personal service when you book with Beach Cottages No.1 or No. 2. We live beside the cottages and we are happy to answer any queries that you might have. We also run The Western Light Art Gallery on the Sandybanks just as you enter the village of Keel. The cottages look out across Keel Bay to the Minaun Cliffs. There is lots to do on Achill and if you need any advise just call over to Margaret or Sean in the Gallery and we will help you out. Special Offers will be listed here when available. Last Minute Deals. Updated January 2018. We have no last minute deals available at present. © Copyright 2018/19 Sean Cannon. All Rights Reserved.